For the cookie dough, in a large microwave-safe bowl, melt the butter with the brown and granulated sugar. Stir to combine. Stir in the milk, vanilla, and salt until well blended. Stir in the flour until completely smooth. Let the mixture cool completely (so the chocolate chips don't melt) then stir in the chocolate chips. Line an 8X8-inch baking pan (preferably with very straight sides) with two pieces of parchment paper (cut into 8-inch strips) so they extend well beyond the edges of the pan on all four sides; this will help to lift up and easily remove the frozen sandwiches. Scatter half of the dough into the pan and use your hands to press it into an even layer. Top with a second set of parchment strips that extend over each side. Lightly coat the parchment with nonstick cooking spray. Scatter the remaining dough over the top and press into an even layer. Use the parchment strips hanging over the edge to lift out the top layer of cookie dough. Then remove the second layer. Place another set of parchment slings (I know, enough with the parchment already!) in the pan. Peel the parchment from one square of cookie dough and set it inside the pan with the smoothest side down. Spread the softened ice cream over the top into an even layer. 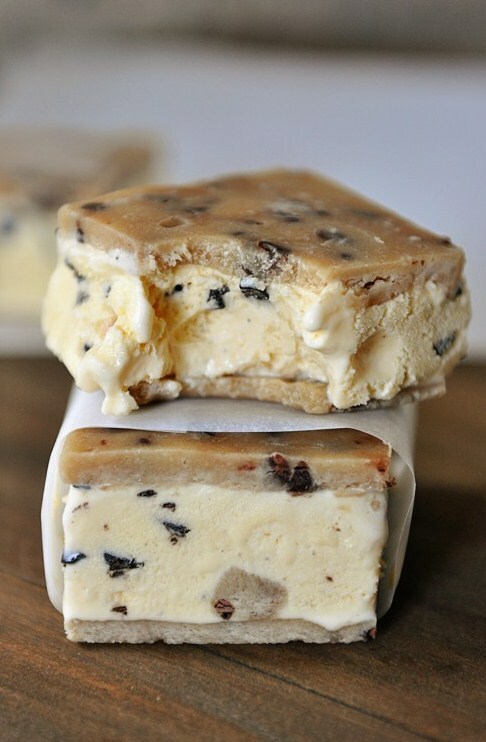 Peel the parchment from the remaining square of cookie dough and place it, smoothest side up, on the ice cream. Gently press it into the ice cream. Cover the pan (with the parchment overhangs, if desired) and freeze for at least 2-3 hours but preferably 6-8. Using a long, sharp knife, run it under hot water, wipe dry, and slice the cookie dough ice cream sandwiches into squares, repeating with hot water after each slice (you can lift up on the handles to remove it from the pan before slicing - I found I had to run a knife around the edges to loosen any ice cream that had stuck to the pan corners). Eat fast so they don't melt!